At Coollink, we take our time to design and deploy solutions tailored to meet your enterprise's requirements. Your connectivity is your backbone for everything, from e-mail communications to ERP (Enterprise Resource Planning) applications, inter-company communication, critical data backup, data centre transfers and most importantly your infrastructure efficiency. We are truly “THE” one stop shop for business connectivity fully backed by our dedicated Enterprise Customer Care department. We are putting our knowledge and expertise at your service. Looking for speeds of 100 Mbps and above? Do you need to transfer large amounts of data at high speeds? A dedicated fibre link is your best option. Contact us for a consultation and a proposed customized solution for your requirements. 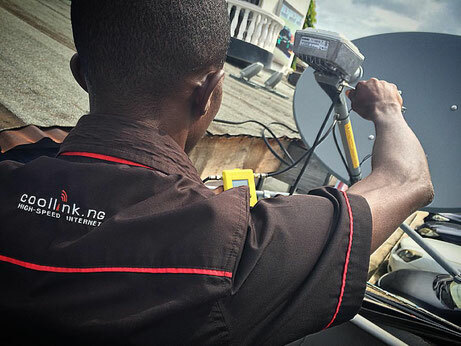 Satellite communication systems are key technologies that will help you have a global, resilient and reliable connectivity solution. You can connect anyone, anywhere on the planet and have access to communication and data transfer. Satellite is also the best solution for backup and redundancy for all your mission critical applications or processes. Getting a good connection from wired infrastructure can often be problematic. This is where point-to-point wireless connectivity will really benefit. High quality wireless devices will connect your company and also allow you establish a strong network between yours buildings or campus sites. Wireless connectivity is also a major solution to backup your fibre network.